Flow Rate: 500 GPH, Port Size: 3/4 "
Rigorous engineering and testing helped generate this series of RuleMate automatic bilge pumps. RuleMate pumps are tested to the highest standard providing better efficiency for the toughest applications. RuleMate bilge pumps operate using an internal level sensor. 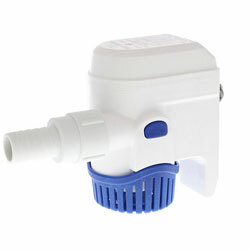 When water reaches the sensor the pump activates and pumps water out. When water level goes below sensor the pump switches off. RuleMate pumps use a unique back-up feature that will let you know if something has covered the sensor. This prevents the pump from running when it shouldn't, giving you peace of mind.